NEW YORK, New York — On September 15, the Hayastan All-Armenian Fund officially unveiled the renovated community school of Artsni, a village in Armenia’s Lori Region. The reconstruction of the campus was financed by the government of India, which provided the Hayastan All-Armenian Fund with a project grant totaling close to $221,000. The grant was awarded through the Indian government’s Development Assistance Programme, benefitting friendly states such as Armenia. Achal Kumar Malhotra, ambassador of India to Armenia; Sergey Manasaryan, deputy minister of foreign affairs of Armenia; Aram Kocharyan, governor of Lori; and Ara Vardanyan, executive director of the Hayastan All-Armenian Fund joined Artsni residents for the highly-anticipated ribbon-cutting ceremony for the project, formally announced in February of this year. 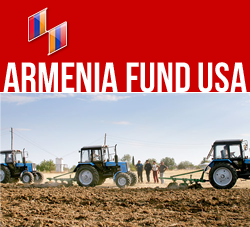 Artsni is the site of two other major projects implemented by the Hayastan All-Armenian Fund. A newly built community center was completed this past summer and the construction of a potable-water network is underway. As he addressed the attendees, Artsni Mayor Khenko Khachanesyan sadly noted that the population of the village has declined considerably since the 1990s; the community school now has 49 students but some 300 pupils once attended the campus. Despite the fact that the residents of Artsni will no longer be forced to carry water from nearby springs thanks to the construction of a drinking-water supply system, the village still grapples with a host of problems that have led to an exodus of the youth and the consequent diminution of the community’s workforce. In his remarks during the opening of the school, Khachanesyan mentioned the lack of natural-gas and potable-water services, preschool facilities, and community leisure activities as the overarching issues still impacting Artsni. Within the next week, the Fund will donate five computers to the Artsni school so that students may acquire computer skills.